The term vestibular nuclei refers to five cell groups located dorsolaterally in the medulla lateral to the fourth ventricle and ventral to the cerebellum. They are the major recipients of direct input from the vestibular nerve. 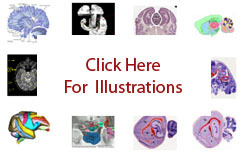 Found in the human ( Carpenter-1983 ), the macaque ( Martin-2000 ), the rat ( Swanson-2004 ) and the mouse ( Dong-2004 ), they include the superior vestibular nucleus, lateral vestibular nucleus, medial vestibular nucleus, descending vestibular nucleus and interstitial nucleus of the vestibular nerve. Some authors include nucleus y ( Holstein-2012 ) and some exclude the interstitial nucleus of the vestibular nerve ( Swanson-2004 ) from the group. Functionally they are part of the vestibulomotor regions of the behavior control column ( Swanson-2004 ).